After several hours of research and careful review of the most popular models in all price ranges, I made my selection of 8 smartphones that are the best value for money in the current market. My preference is the OnePlus 6T, which combines design, performance, and battery life able to compete with some smartphones to more than 1000 € for a price that remains frankly correct. But I admit that in amateur of Samsung, I also have a small crush on the Samsung Galaxy Note 9. I invite you to consult my guide at the end of the article to determine the essential options for your future smartphone, all in a budget that suits you personally. If you have a tight budget but you do not want to be made by choosing a low-end smartphone, I have selected 3 models that, for less than 300 €, offer quite respectable performance. The first model of my selection is, without much astonishment, proposed by Xiaomi, known for its strong penetration of the low-cost smartphone market. But what says lowcost does not necessarily say poor quality and, from this point of view, the Chinese manufacturer is well known for its excellent value for money ratio. Released in the summer of 2018, the Xiaomi Redmi Note 6 Pro has been touted as the successor to the excellent Xiaomi Redmi Note 5, with which it has many similarities. Design side, first of all. Despite its low price, it incorporates a matte metal back shell, which has the advantage of not retaining fingerprints and gives a robust appearance to the smartphone. Easy to handle with its 6.26-inch screen, rounded edges and excellent edge/screen ratio, you can almost use it with one hand. By cons, if I have to find a lack of ergonomics, it is in the placement of its fingerprint sensor, located on the back. If it is well placed to fall easily under the index, it represents, in my opinion, the disadvantage of not being useful if you put the smartphone on support (by car, for example). Its full HD screen offers a very nice display, although I recommend you to play on the parameters, and in particular to select the color mode “hot” to get a well-calibrated colorimetry. And since it has good contrast and excellent brightness (both low and high light), it has almost no difficulty of readability to the sun. Component level, it integrates a Snapdragon 636 processor. And concerning the RAM, it depends on the model you choose. It is possible to have a version 3 GB of RAM coupled with 32 GB of internal memory (the version that I present to you here) or a version with 4 GB of RAM combined with an internal memory of 64 GB. But even with “only” 3 GB of RAM the device is very responsive, has no problem of fluidity, and allows to run properly a large part of the games in the PlayStore. By cons, if you are a fan of 3D games – more greedy – I recommend you opt for the 4GB version of RAM. Anyway, do not make the decision based on the internal memory (32 GB against 64), since the smartphone has a Micro-SD slot allowing you to expand its memory. Level photo, it takes the same concept as the Redmi Note 5, which proposed a dual sensor on the back: one of 12 MP and the other 5 MP, the second being supposed to reinforce the first in case of bass light (a point that is often lacking in Budget smartphones). And, honestly, it works pretty well. In full light, the colorimetry is faithful, and the level of detail is quite high. In low light, of course, this is another story, with a digital noise that is very present, but it is rather correct compared to what is generally seen in this price range. At the video level, the Note 6 Pro includes an electronic stabilizer, which improves anything rendering compared to what is usually achieved with smartphones in this price range. Recording in Full HD is therefore correct in bright conditions (but you will not get anything conclusive in low light). Autonomy, on the other hand, is one of its strong points: thanks to its battery of 4000 mAh, it allows to reach almost 20 hours in “normal” use (a little call, a little surf, a little bit of game, etc.). This is frankly honorable compared to what we see today and, by sparing it a little, you can easily recharge it only once every two days. An amazing point is that the charging is done by Micro-USB and not USB-C. Too bad, with a device so recent it would have been welcome. Android level, it currently runs on Android 8.1 with the overlay MIUI 10, and we see a willingness of Xiaomi to lighten a little overlay, even if the Redmi Note 6 Pro always has a series of preinstalled applications most of which of us are probably going very well. In the end, with the Redmi Note 6 Pro, we have an improved version of Note 5 which was already excellent value for money, and this for a budget that does not move almost. The Nokia 6.1 is the 2018 version of the Nokia 6, with which the brand had marked its willingness to get back into the race of low-cost smartphone quality. And the result is at the rendezvous. On the design side, it is very elegant, with its metal shell and the slight gold edging that surrounds it, although I personally find that with its projecting slab and sharp angles, its edge/screen ratio is less optimized and spoil the whole thing. The 5.5 “screen offers a Full HD definition. Below, there is a Snapdragon 630 processor, 3GB of RAM and 32GB of memory, with of course a Micro-SD port allowing you to expand its memory. And despite its low price, it ships an NFC chip (to make your payments without contact) and it offers a USB-C connection (which unfortunately remains very rare in this price range). Performance level, the management of the tasks is rather well optimized. Of course, at this price and with this RAM we know that it is not designed for games, but its performance is sufficient to ensure a certain fluidity, even on the most greedy games. This is most likely, in part, related to the fact that the Nokia 6.1 has the Android One label. That is to say? This is a label given by Google that certifies that the smartphone has the latest security updates, is protected by Google Play Protect and is not modified by the manufacturer. This allows you to have a less invasive overlay, less burdensome (a minimalist Android experience somehow possible), but also to have a much faster deployment of the latest Android updates. The autonomy, it is rather correct, even if it does not break bricks. The 3000mAh will not last much more than 15 hours in “normal” use, which is not bad. The camera offers a satisfactory result, with 16Mpx and a well-calibrated colorimetry. The general quality is correct in daylight, but in low light the colors become blotchy and the whole lack of contrast. In short, nothing surprising in this price range, even if the result is rather correct given what is sometimes done to the competition. In selfie mode, there is a kind of overexposure of the subject in relation to the backplane, which allows obtaining a large number of details but offers an unnatural rendering. In conclusion, the Nokia 6.1 is an option to frankly consider if you do not have a big budget. If it is not the best in its category, in terms of overall performance, it nevertheless has the significant advantage of integrating Android One, for a welcome return to simplicity. As you might guess from her name, with the Play model, Honor tackles the market for mobile gaming enthusiasts. Design level, if Honor did not go to the side of originality, it’s rather elegant, with a matte metal coating that does not catch fingerprints. The 6.3-inch Full HD screen is quite well optimized at the edge/screen ratio. It has very good contrast and brightness, which makes it easy to read even in direct sunlight. On the other hand, again, the fingerprint reader is at the back. But if it bothers you, know that it is also equipped with a facial recognition system, although this feature is highly dependent on the light conditions on this smartphone. In terms of components, it stands out from its competitors in the same price range by integrating a processor Kirin 970, one of the most powerful on the market that, combined with its 4 GB of RAM, allowing it to offer excellent performance for everyday use as well as playing with all current games. And if it includes an internal memory of 64 GB, it is expandable via the Micro-SD port, which is optimal if you like to collect the games you play (or have played). By cons, if it turns out very good for the practice of games, it is a more discreet photo. The colors are saturated and often tend towards fluo in full light. And in low light, the electronic noise is really invasive. In short, if you plan to take souvenir photos with your smartphone, go your way on the Honor Play. In selfie mode, artist-style smoothing of K-Pop is inevitable. Video side, if it can record in UHD, I recommend you to limit yourself to Full HD, where the results will be much more usable. Side battery, it is not left behind, with its 3760 mAh battery offering a little over 16 hours of use, placing it between its competitors Nokia and Xiaomi. The recharge, it is via USB-C! In the end, I definitely recommend this smartphone to fans of mobile games that do not have a big budget and for which the photo quality does not matter. Most users should find happiness in this section. Without breaking the bank for the latest high-performance smartphone, here are three models that combine hardware quality, display quality, performance, endurance, and photo quality. Admittedly, they will never be excellent in all areas, but they constitute a significant balance that makes smartphones value for money really attractive. Released in the fall of 2018, the OnePlus 6T is the second version of the 6, which corrects some flaws. So I know we are making a jump in prices compared to the previous section, but since this smartphone even has what compete with some models over 1000 €, it’s frankly “cheap”! Design side, again, nothing new on the market, but it works: impeccable finishes, clean lines. The 6GB version is only offered with a shiny black glass shell, but if you go to the 8GB, you can also opt for a matte black glass or a purple glossy glass (my favorite!). With its Oled 6.4 inch screen, you can forget the one-handed manipulation, but the ratio of edges to screen is well optimized so you can do a lot of things with one hand. Moreover, we must admit that the technology embedded by the fingerprint sensor has a mouth! On the other hand, I reproach him for being a little capricious. But if you pair it with facial recognition – which is pretty awesome – there’s no need to unlock your smartphone very quickly. The screen, it, displays a flawless colorimetry, even by default. The brightness and contrasts are excellent, as the management of anti-reflective, which allows you very good readability in all circumstances, even under a blazing sun. And the point of view photo, it is a champion (which led us to give him preference among our selection of the best smartphones for photo). Its dual 16 MP and 20 MP sensor are accompanied by an effective optical stabilizer. In daylight, the result is detailed (with a very, very slight loss on the sides), the colors are faithful. In short, we expected it. But where he surprises is on his photos in low light: obviously, the smoothing is more present, but the cliche remains detailed. It is one of the best in the market at this level. The image quality, moreover, is present on video, even in 4K, where the fluidity remains. At the component level, it includes a Snapdragon 645 processor (which was the latest generation of Snapdragon), coupled with 6 GB of RAM. Free to you, however, to go to the option to 8 GB, containing an internal memory of 128 (as with this model) or even 256 GB. But already with the 6 GB option, the OnePlus 6T excels to run any game from the PlayStore. Side autonomy, it is in the champions in view of everything it embarks! You can count a little over 16 hours of use, which means that for traditional use, it should last you 2 days. By cons, and this is a huge defect, in my opinion, exit the jack mini jack on this model! Fortunately, the brand provides a USB-C to the mini-jack adapter to allow you to use your headphones, but, honestly, a direct connection would have been preferred. Finally, if you are not at all connoisseur of OnePlus, know that this model, as is always the case with the brand, embeds the interface OxygenOS, which is a really little remodeled version of Android, which you let you not be cluttered with a variety of apps, widgets, and more that you never use, and makes navigation much smoother. In the end, the OnePlus 6T is probably the smartphone that I recommend at the moment. With its capabilities, it is able to go tickle smartphones and iPhones sold more than 1000 €, and all it offers is qualitative. I will blame him for his lack of mini-jack and incredible footprint sensor but capricious. A diva, what! While mounting a range in terms of its components and performance, the Honor 10 is sold at a price not far from the models that I presented in the “cheap” section. Design side, if the edges are more present than the OnePlus 6T, we have a nice ratio edges/screen, which makes it a rather elegant model, with its iridescent glass shell declined in black, blue or green (my favorite) and it finishes well worked. Its 5.84-inch screen and its slightly curved edges make it a very pleasant model to hold in hand, and with which you can already navigate a hand. This time, we find the fingerprint reader on the front. The mechanism is responsive and effective, even if your fingers are wet or stained. The screen offers this time an IPS panel, but the quality is at the rendezvous, with a balanced colorimetry if you take the time to play a little bit about the display settings, and the brightness and contrast offer good readability in the sun. In the photo, Honor 10 is doing well (and even very well) with his dual 16 and 24 MP sensor. The result is balanced, bright, rich in color and rather well detailed in full light. In low light, on the other hand, as is generally the case, the smoothing completely ruins the photo. In selfie mode, it does a pretty good job, with its sensor 24 Mpx, although, as often, the result is a little too smooth. Inside, there is a Kirin 970 processor, coupled with 4 GB of RAM. It’s a winning combo because the Honor 10 does not suffer from any fluency problem, on any PlayStore game. Side internal memory, it will be necessary to choose between the version to 64 GB and that to 128. But choose well, because the Honor 10 offers no possibility of memory expansion. Pity. Autonomy is one of its strengths, with just over 17 hours in normal use, which allows you to shoot it for about two days if you spare it. In the end, I wanted to offer you this smartphone that is the right balance, in my opinion, between the models presented in the previous section and its two direct competitors mid-range. Without being quite excellent in any field (if it’s not autonomy and management of games), it is very good in everything, and for a price that remains very attractive, especially if you limit yourself to the 64 GB version. The Huawei P 20 Pro, released in spring 2018, is probably the spearhead of the Huawei brand. And if it was initially launched on the market at nearly € 900, the price cuts it has already suffered make it a must at the level of value for money ratio at the moment. Firstly design, I appreciate again the presence of the fingerprint sensor on the front of the device, which does not spoil the optimization of its edge/screen ratio. Its glass shell is offered in black, blue and purple (my favorite!) And has impeccable finishes. The good surprise is that it is the first smartphone of my selection to present a waterproofing certification: IP67, which means that it is resistant to dust and water, with immersion up to 1 meter for 30 minutes. (Note that OnePlus claims that the OnePlus 6T is also waterproof but, without certification, I would not venture to try it!). The 6.1-inch screen, like the OnePlus 6T, features Oled technology. The brightness and contrasts are just excellent, as the overall color, moreover, if you take, again, the time to go through the parameters. The photo is probably the point on which Huawei most based its promotional campaign, highlighting the triple sensor performance (40, 20 and 8 Mpx). In fact, it’s (very) good, but not a revolution like that was announced. In full light, the result is unquestionably faithful, balanced and detailed, but the differences with some competitors are also not obvious. In low light, by cons, we must recognize that it is probably the best smartpĥone on the market in terms of photos. As usual, the front sensor 24 Mpx, if it is satisfactory, does not give results free of smoothing. In the video, if it allows mounting in 4K, the result is less satisfactory than with the OnePlus 6T (the electronic noise is no longer present), but it is optimal with UHD at 30 ips. Component level, we find as on the Honor 10 processor Kirin 970, this time accompanied by 6 GB of RAM. Not surprisingly, it will not fail under any circumstances, even with the most greedy games of the PlayStore. Finally, the autonomy is very close to the OnePlus 6T, since it also takes a little more than 16 hours to use, and about two days if you spare. By cons, I have two major complaints to him. Like the OnePlus 6T, it ignores the presence of a Micro-SD socket, which prevents extending the memory of the device (even if the minimum value of 128 GB leaves room for space), and it also gets rid of the mini-jack port (although, again, it provides a USB-C to mini-jack adapter). In the end, it is an excellent smartphone, especially in a photo, which suffers just being caught up, at the moment, by the OnePlus 6T, which has a lot of common points, but which I prefer, personally, the design and the lighter interface. What is certain is that the price reduction that has benefited since its release makes it one of the best value for money ratio of the moment! Well, it is not because we are ready to put a higher price that we are ready to accept anything and, conversely, a higher price does not guarantee that what the smartphone integrates is worth. I still found two models that seem to me to consider a happy medium, offering some of the best features of the market without completely raving in the price offered. Well, to be perfectly honest, I always had a soft spot for Samsung smartphones. But I assure you that I tried to remain perfectly honest against Samsung Galaxy Note 9, which I consider almost reaching perfection (if not ergonomically), especially now that its price has already strongly decreased since its release (it was then around 1000 € in its 128 GB version). Design side, it must first admit that with its 6.4-inch screen, despite a ratio edges/screen well optimized, it is difficult to use one-handed. The range Note had initially been developed in the optics of phablets – these hybrids between smartphones and tablets – and even if it tends to shrink, its devices remain impressive. This time, it has IP68 certification, which means, besides its resistance to dust, it can even be immersed deeper than 1 meter. The Oled screen is simply excellent. Whether in terms of colorimetry, brightness, contrast or the management of anti-reflection, it has no defect and remains legible in all circumstances. Level components, it embeds an Exynos 9810 processor and 6 GB of RAM in the version that I present to you, with 128 GB of internal memory. But you can opt for 8 GB of RAM also if you go to the 512 GB version. Honestly, I find that so much memory is useless unless you actually make the tablet side of the device profitable. Because otherwise, even in its version 6 GB, it does not suffer at any time of any problem of fluidity and does not make any concessions on the graphics, even with the most greedy games, which are all the more pleasant to use at given the size of the screen. And despite all this, the autonomy remains very correct, since it reaches a little over 15 hours in use, and you can use it two days before reloading if you spare a little. Finally, what is the fame of the range is also the stylus that accompanies the smartphone, and can be stored in the sheath adjacent to the device. This time, it is compatible with Bluetooth, which even allows you to use it as a remote control to scroll your photos remotely, for example. In the end, if you have a larger budget to allocate to your smartphone, I think the best value for money ratio of high-end is here, especially now that it has suffered reductions of more than 200 € in all its versions. Excellent screen, excellent photo management, very good autonomy, ease of use with the stylus … I only blame him for his ergonomics perfectible (and the screen a little big for my taste for a smartphone, but that’s really a question preferably personal). Although it has not yet suffered a significant price reduction since its release, the initial introductory price of the iPhone XR places it, compared to its competitors Apple (where the trend is beyond the bar 1000 €), among the most interesting value for money ratio of the moment. 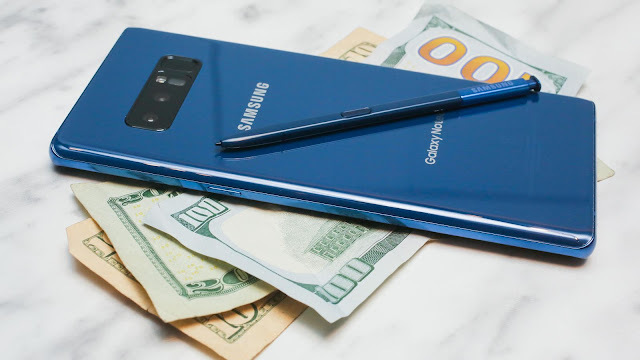 Its 6.1-inch screen brings it back, compared to the Samsung Note 9, among smartphones more affordable in size, and more easily tenable (and manageable) with one hand. As always at Apple, the finishes are impeccable, and its glass coating offered in various colors is the most beautiful effect, including coral. On the other hand, its optimization of the ratio edges/screen is less good than on the preceding models, which can be explained by the return of an LCD screen, which is rather surprising in a world where the high-end smartphones tend more and more to adorn themselves with an Oled screen. But, with pleasure, we find the fingerprint reader facades, which comes to replace the mechanism of facial recognition. And of course, for a smartphone of this price, it is certified waterproof, with an IP67 certification, like the Huawei P20 Pro. As I said, Apple comes back to an LCD screen, but it does not prevent it is excellent, both in the field of colorimetry as brightness and contrast, although it is obviously lower than this. that we could get on an Oled screen. The result is still a smartphone-readable almost in all circumstances. The photo, although it is excellent in general in terms of what is done in the field of smartphones, is not comparable to that of the Samsung Note 9, particularly in low light (even if the rendering remains correct). Performance side, next to its A12 Bionic processor, it embarks “only” 3 GB of RAM (for example, the XS, with the same processor, proposes 4). It remains nonetheless very fluid and easily usable in a game thanks to an optimized graphics chip. For internal memory, you can choose between 64GB, 128GB and 256GB versions. Of course, it does not have a Micro-SD drive allowing you to expand the memory (but this is usually the case at Apple). On the other hand, it does not have mini-jack either, and that, it bothers me more (even if, again, it is common at Apple.It is just a pity that the adapter is not provided, as is the case with other competitors, as we have seen). Side autonomy, I admit that I expected better, even if it reaches a little over 13 hours of use (two days if you spare). It is obviously very correct, but it is less than the competitors that I presented to you, while Apple is generally known in the field. Finally, the iOS interface, as always, is fluid and pleasant, and one of the reasons we generally turn to Apple. In the end, it is not the best iPhone market, but it is the best quality/price ratio of the brand in my opinion. It makes some concessions compared to its big brothers but remains powerful where it is generally needed, and for a much more attractive price. How To Choose Your Smartphone That Gives Value To Money? Well, I think I’m right in saying that the smartphone is probably the essential high-tech tool par excellence in our modern society. The advantage – and the problem! – it is found of all kinds and at all prices. So, what are the really important elements to take into account if you want to be sure of getting value for money and avoid a bad surprise? The processor is a little like the brain of your device, the one that manages the flow of requests you send it. As a result, the more powerful it is and the faster you can open your applications, the easier you can manage image editing, or the better you can play without lag. At the time of writing, the most powerful smartphone processor is the Snapdragon 855. The size of the display roughly determines the size of your device (although the edge/screen ratio also strongly influences this). It is measured in inches. The bigger the display, the bigger is the smartphone, but also more immersive is the experience. Modern smartphones use either IPS-LCD technology or Oled technology for display. IPS technology is perfect for people wanting to do a lot of video editing on their phone, but if you want vibrant color, HDR video, and better battery life, a smartphone with Oled technology is a better choice. As with a computer, the more RAM your smartphone has, the more you can easily manage multiple tasks at once. Smartphone RAM is measured in GB, and the offer typically ranges from 1 GB to 8 GB. Smartphones generally run on Android and iOS, Tizen (Linux) is less common and the end of Windows Phone support is announced for December 2019.
iOS is the operating system of Apple, which you find on all iPhones. Intuitive, it is regularly updated. It’s a closed system (there is very little customization possible) but the number of applications developed for the Apple Store is simply staggering. Android is the operating system of Google. This time, it’s an open system: every manufacturer can install Android on their products, subject to certain conditions. This is why Android is the most widely used mobile operating system. By cons, suddenly, there are different overlay: manufacturers (eg Samsung) add their own interface to that of Android, which allows you to have access to some additional features if you opt for one brand or another. The only problem is that it can weigh down the system and delay Google’s updates. If you like to take a lot of photos and install a lot of applications, you have to pay special attention to the storage space. Fortunately, many models of smartphones have a Micro-SD drive, which allows you to expand the memory of your phone, but this is not always the case. Beware of smartphones with less than 16 GB of memory, because it’s really light, especially if you know what place Android and its overlays take (because, of course, the memory presented on the data sheet is the total memory, of which you have to deduct everything that is already pre-installed on your smartphone). There are three types of material for your smartphone: plastic, metal, and glass. The main advantage of plastic is that it allows for excellent reception. It is also often cheaper. By cons, it gives a look more “cheap” to the device (which is not necessarily justified). Its main disadvantage is that due to less dissipation of heat, it tends to heat up faster. Metal (most often magnesium or aluminum) has the main advantage of being resistant, and to allow better dissipation of the heat. On the other hand, if your smartphone heats for one reason or the other, it is much more unpleasant than with a plastic shell. The glass became popular with the appearance of Gorilla Glass, which is ultra resistant. Initially mainly used in front, it is increasingly used also in the back, to offer a wireless charging system, since it lets the electromagnetic waves much more effectively. On the other hand, if it is damaged, there is a good chance that your smartphone will become unusable. The technical characteristics of a camera can be misleading. The number of pixels (expressed in Mpx) does not really mean much. The best way to get an idea of the quality of the camera of a smartphone is to consult shots from other users. If the battery irremovable tended to disappear in recent years, it is back in force with the latest Chinese models appeared on the market. It’s a shame because the battery is one of the most sensitive elements of a smartphone. If it is integrated, in case of failure, you can completely throw away your smartphone! If manufacturers choose not to put a removable battery, it often feels the planned obsolescence policy, which is a disaster for both you and the environment! This data is without a doubt the least reliable. Expressed in mAh, it has relevance only if we have in mind the sum of the consumption of all components of the phone. For example, some smartphones may offer 6000mAh, which is twice the current standard, they will not necessarily last much longer. The best is still to look for a professional test or to rely on the experience of other users if you have the opportunity. In Conclusion, Which Value For Money Smartphone To Choose? The question of value for money is difficult to address because it still depends on your specific needs and especially the budget that you are willing to spend on your smartphone, a smartphone at 800 € can sometimes represent a better value for money ratio than a model at 200 €. If you are looking for a smartphone that will essentially serve as a daily communication tool (SMS, calls, and a few shares on social networks), a low-cost model may be enough for you, and in this category c is the Xiaomi Redmi Note 6 Pro which is the most interesting model of the moment. On the other hand, if you do not care about the photo, but it is important to be able to entertain you with the various games proposed on the PlayStore, all in an always tight budget, it is without hesitation towards the Honor Play that I direct you. But if your needs are more advanced, both in terms of photography and fluidity, it is necessary to go through a larger investment and, at this level, in my opinion, nothing beats the OnePlus 6T. Finally, if you are looking for the best in all, a model like the Samsung Galaxy Note 9 should make you happy. While the price is much higher, but when you compare the quality of what it offers compared to the price of some competitors, it is undeniably a case. Among the low-cost smartphones, the Motorola E5 is definitely an option to consider, in that, while offering no advanced functionality, it offers everything you need in a smartphone, and for less € 150. Still, among the low-cost models, this model of Xiaomi offers the main advantage (besides its low price) to shoot Android One. This is a great alternative to the Nokia 6.1, except that it is less good in the photo. Straddling Note 8 and Note 9, Samsung’s smartphone offers excellent screen and photo performance, while being offered today at a much more attractive price than the Samsung Galaxy S9 Plus. Note 9. This Google smartphone is one of the great references in photography. Its 5.5-inch screen of exemplary quality also allows good handling and true management with one hand, which is refreshing in this area where manufacturers tend to go to the largest at the expense of ergonomics.